Behavioral economics patterns in social security? Apparently, people are responding not only to financial incentives but also to how the decision is framed. 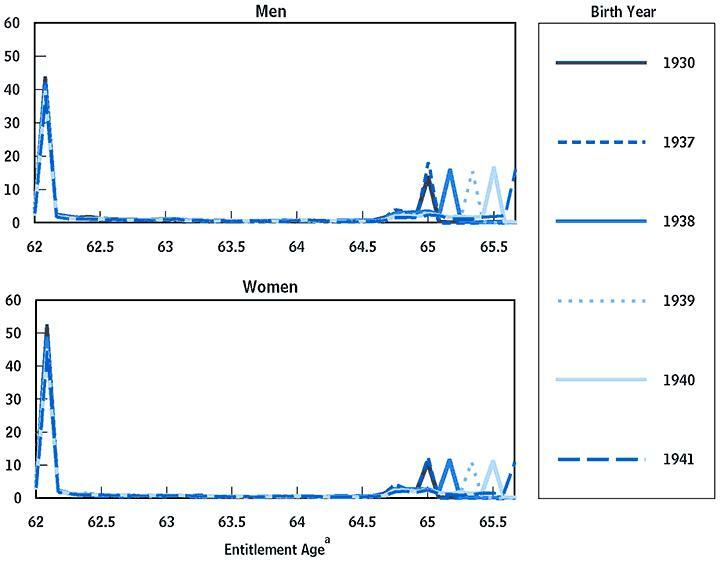 If someone claims the early benefits at age 62, Social Security payments are decreased relative to what they would have been if the person had waited, but the adjustment is actuarially “fair”; so, on average, the typical retiree will receive roughly the same amount of benefits, in net-present-value terms, regardless of when benefits are first claimed. In the other direction, if someone postpones claiming benefits, the payments are increased the longer the person waits, up to age 70. Thus, there is nothing “special” about the full-benefit age that should cause a disproportionate number of people to first claim benefits at that age rather than at, say, 63 or 68. Instead, the full-benefit age seems to act as a signal that leads a substantial number of people to target that age. There seems to be an important factor that Orszag overlooks; one that, upon reevaluation, makes the two spikes fit more neoclassically rational expectations. Social Security penalizes workers who earn wages above a certain amount before reaching full-benefit age. For workers younger than full-benefit age, every $2 in wages earned over $13,560 means a $1 reduction in benefits. For workers who are becoming eligible for full benefits this year, every $3 in wages earned over $36,120 means a $1 reduction in benefits. These steep penalties actually do make full-benefit age “special.” Even if the benefits are actuarially “fair,” the penalties associated with working any full-time job paying over $6.50 can make delaying financially attractive. The signaling effect of the full-benefit age might be used as a policy tool. Compare, for instance, increasing the full-benefit age with adjusting the benefit formula while keeping that age the same. Even though both methods could be designed to produce a similar overall reduction in Social Security benefits, the two policies might very well affect decisions about claiming benefits (and therefore presumably retirement) differently. The evidence from the 1983 reforms suggests that an increase in the full-benefit age would cause a substantial proportion of people who once would have claimed benefits at age 65 to delay when they do so and, presumably, when they retire; but an adjustment to the benefit formula would probably have a smaller such effect. Orszag does make an important point about the difference of between revenue neutrality and political neutrality. For elected officials, reducing benefit levels versus pushing back the retirement age is not an inconsequential or neutral choice. Politically speaking, reducing benefit levels is a more damaging option – thanks to voters’ loss aversion – which is likely why Congress decided to push back the retirement age in 1983 rather than cut benefits. Politicians aren’t always the fools many voters take them for. When Social Security restructuring is debated seriously – whatever faraway year that may be – look again for benefit delays to be a more palatable to voters and Congress than either tax hikes to cover existing benefits or sharp benefit reductions. Hat tip: Mostly Economics who first pointed out this speech.